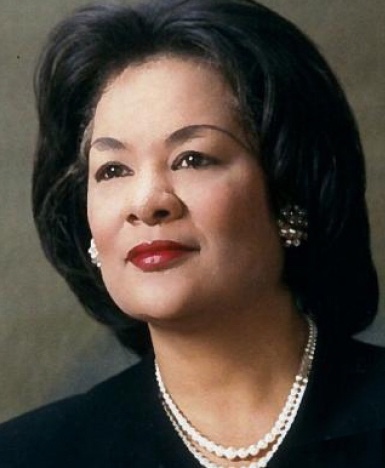 As a distinguished Colorado State Representative, Wilma J. Webb served six terms in the Colorado House of Representatives and among her accomplishments was the introducing and passing of bills to establish Dr. Martin Luther King, Jr. Day, Long-Term Home Health Care for senior citizens, and Drug Treatment Care for assistance to substance abusers. Her political involvement in civics began as a community organizer to register voters, assist impoverished families, and encourage equality in Education. From 1971-1980, she served as a Democratic Committeewoman, District Captain, and elected Secretary and Editor for the Colorado Democratic Party. In 1980, she was voted in by a vacancy committee to fill an unexpired term for State House District 8. During her thirteen years in the House, she successfully sponsored several substantive bills and served on Colorado’s Joint Budget Committee. When her husband, Wellington E. Webb, was elected as Denver’s Mayor in 1991, she embraced her position as First Lady. Among her work, she chaired the Mayor’s Commission on Art, Culture, and Film, and secured major art pieces for Denver. The Denver Art Museum recognized her contribution to the arts community with a bas relief sculpture of her. In 1998, she was appointed by President William J. Clinton as Region VIII’s chief administrator for the U.S. Department of Labor. She was the first African American woman to serve in these positions. She is a mother to four adult children, and a grandmother. She continues to be a leader and to serve Denver and Colorado.